» Have we reached 'peak gold'? Do you think that whenever good things happen to the economy, equity investors make money? No matter how good the event. Take the greatest event in India's economic history for example: The 1991 liberalisation of the Indian economy. We just celebrated 25 years since that hallowed moment when then Finance Minister Manmohan Singh presented the budget before Parliament on July 24, 1991. It was the budget that kicked off the reforms. If India's modern economic history has to be pinned down to the single most important event, this was it. These reforms changed the way India lives. In effect, it took us from living like ascetics to being spoilt for choice in every area of life. When the reforms were announced, investors were quick to realise what was in store for the Indian economy. Naturally, they were excited. In fact, if the stock market was any indicator, 'excited' would be an understatement. Elated about the prospects that lie ahead for the economy, and further spurred on by 'big bull' Harshad Mehta, the BSE Sensex went on to see a price-to-earnings multiple (PE) of more than 55 times. Well, the reforms delivered. They brought on all the anticipated benefits to the economy over the next 25 years, and more. The stock market, though, would never see such a valuation again. Not even close. In their excitement, all calculations had gone out the window. Investors were willing to pay just about anything to get their hands on stocks. And when that happens, disaster - almost always - is just around the corner. Be it liberalisation, a new government, GST or a great monsoon, you always got to ask the all-important question: Everything said and done, am I paying too much for the stock in relation to its intrinsic value? For even though the company may turn out to do very well, or the economy may have some great years ahead of it, when you pay too much, even a good stock can quickly turn into a bad investment. How important do you consider valuations in investing? Would you pay anything to get your hands on a stock with great prospects? Let us know your comments or share your views in the Equitymaster Club. And what do we have to show for our effort? Recommendations that generated returns like 250% in 2 years, 217% in 3 years 11 months, 288% in 2 years 5 months, 133% in 1 year 3 months! Of course, past performance does not guarantee future returns...And you need to keep that in mind. If today's chart of the day is any indication, looks like investors have rekindled their romance with bond funds. As the chart highlights, close to a whopping Rs 70 bn have been poured into debt funds by investors since June 1, 2016. In comparison, equities have attracted investments worth a paltry Rs 4 bn during the same period. In fact, even the couple of months prior to that, debt funds have garnered significantly higher inflows than their equities counterpart. The reason? Well, the old habit of looking into the rear view mirror and not the windshield. 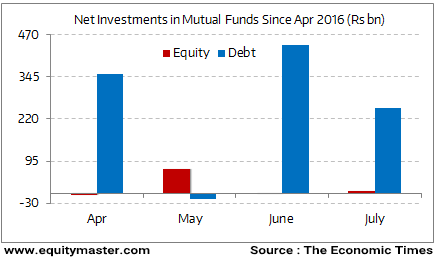 Experts contend that since debt funds have given better returns than equity mutual funds over the last one year or so, investors are optimistic that the trend will continue. They further argue that as stocks markets are looking expensive and as there are hope of rate cuts on the anvil, there's even more reason to tilt towards debt. Well, according to us, it is not the returns of the past but the valuations that count. Stocks have run up alright but they are nowhere close to being very expensive. 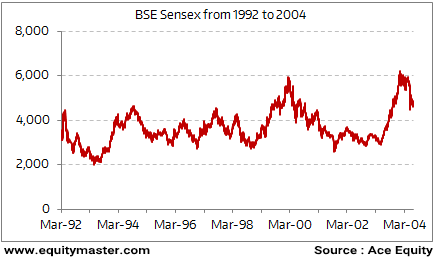 In fact, at the current valuations, the Sensex is trading at a small premium to its long term average, which in our view cannot be termed as very expensive. Besides, when you consider that corporate profit margins are at multi-year lows and could rebound over the medium term, then the case for equities becomes even stronger. The current markets call for at least a 50%-60% tilt towards equities and the rest towards debt if not more. Now here's a gold story that you may not have heard before. It is reasoned that when giant asteroids crashed into planet earth billions of years ago, one of the elements that emerged out of this collision was the yellow metal gold. And that's it. All the gold that's there above the earth's surface and below it is a result of those collisions that took place billions of years ago. In other words, gold can only be discovered in gold mines and cannot be created from other elements. In fact, even if it can be created, the process is so expensive that one cannot currently make money by selling gold that one creates from other elements. The point of this short discourse on gold was to highlight the fact that as per a popular website, we might have reached 'Peak Gold'. In other words, all the gold mines that are to be discovered have been discovered and 2015 was the year that could go down as the year gold production maxed. It is argued that all the gold production we have done in the past 20 years has effectively left the cupboards bare. And gold producers are hard at work finding the next big deposit which remains elusive as ever even though exploration budgets increased more than 3 times between 2009 and 2012. If this is indeed true then aside of the demand, this new supply side scenario could fire up gold prices even more. Indian stock markets were trading strong today with the Sensex higher by around 100 points at the time of writing. Mid and Small Cap indices were also trading strong, higher by close to 1% each. Amongst sectoral indices, realty and pharma were seen enjoying a good amount of buying interest. This edition of The 5 Minute WrapUp is authored by Rahul Shah (Research Analyst). Inox Wind: Potential Growth Trap? Equitymaster requests your view! Post a comment on "How Investors Lost Money on the Greatest Event in India's Economic History". Click here! 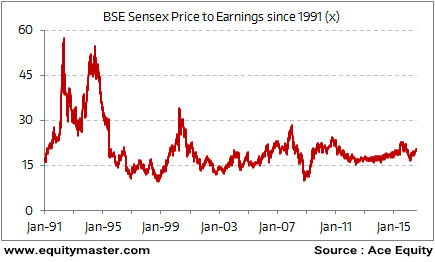 3 Responses to "How Investors Lost Money on the Greatest Event in India's Economic History"
Invaluable information.was never aware that P/E ratios were in excess of 50 in 1992! !THe underlying message is also good. The adage-"Buy on rumors;sell on news"